The months are just flying by and our feet haven't had time to touch the ground. The volunteers have completed repairing the viewing platform overlooking the wet meadow and have helped the Rangers replace the salt marsh fence at the Southern end of the reserve. We've also been involved with some buddying up on other sites such as Fell Foot and working with the South Lakes Team, getting a glimpse of how other very different properties function. It's been interpretation overload with looking into information panels, events posters, display boards and preparation for our summer events. A giant hand made paper mache sand dune system is on show in The Mall shopping centre in Barrow in Furness along with some stunning poster of our wildlife. A big thank you goes out to Lisa our interpretation officer who has taken all our requests in her stride and has done a wonderful job of making it look beautiful! We've had a number of students on site over the past few months carrying out projects that will hopefully help is out in terms of management in the future. One particular study is concentrating on the spread and control of invasive flora species. Having been to visit North Walney and seeing first hand their efforts to control Rosa ragosa we are waiting in anticipation how this will conclude. 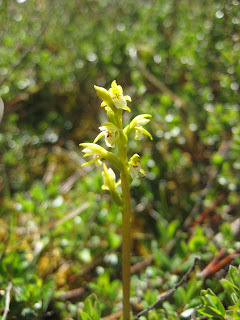 The big draw for people this month was the Coral Root orchid with people coming from all over the UK to get a glimpse. 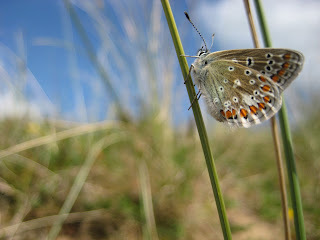 The butterflies are also coming into their own with records of orange tips, green veined white, common blue, small heath and dingy skipper being sighted. Our first record this year of a common darter was noted on the 21st May which seemed pretty early to us...could be a taste of things to come maybe???? After all our exertions filling bags with rock over the last few weeks, we were ready for the arrival of the helicopter to move them. Usually as soon as the helicopter is booked you can guarantee that it'll rain, the cloud will drop or the wind will really pick up or even a combination of these things. This time we were lucky, we were forecast a whole week of settled weather and there was hardly a cloud in the sky all week. Our first helicopter lift involved moving fencing materials over to Stickle Ghyll. As we are due to replace the fencing around the plantation on the left hand side of the ghyll, and since the helicopter was available we thought we'd take advantage. All the materials were carefully bundled together and flown up and we also had a few 20kg bags of grass seed flown up for re-seeding bare areas around the path. The next lift took place in Easedale, flying the bags of rock that we had previously filled over to the path at Helm Crag. The drop site was a tricky one as it is fringed by trees which means an extra long sling had to be used so that the helicopter had plenty of clearance while placing the bags in position. Using a longer sling makes it more difficult for the pilot to drop the bags as accurately, and also increases the likelihood of getting tangled up in the trees. The lift went on well into the evening but we managed to move everything to site and given the awkwardness of the drop site the pilot was spot on with where he put the bags. 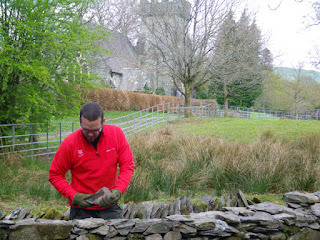 Our final lift was at Aira Force, where we flew in bags of slate for a section of stone footpath that we'll be working on later in the year and also several bags of gravel for resurfacing works. Once again although there's a lot of tree coverage in the area the lift went extremely well and the materials were all moved to site in just a few hours. Well this is what these guys did. Taking part and getting active on one of our working holidays. Fun packed week with twists and terns but a fantastic experience, learning about this part of the Lake District, doing some great conservation work and getting a chance to have a go and enjoy a brilliant outdoor activity. The rest of the week was spent at High Close Garden near Langdale. The house that sits in this 11 acre site is used by the YHA. The original building has been extended over the years but we think there would have been a wooden structure here since the 15th century. The garden covers 11 acres and is part of the High Close estate which totals 535 acres. The garden was originally planted in the 1860s by Edward Balme and was laid out in the fashion of the day using many recently discovered exotic conifers from North America as well a variety of Rhododendrons. In its time the garden would have employed 9 gardeners and a full time path sweeper. The maintenance has been undertaken by the Rangers and volunteers and this work is now ongoing to bring the garden back to life. The gang worked very hard all week with some inclement weather for May but this did not dampen there sprits. Work has been ongoing in the garden to remove Rhododendron from the site. We collected logs and brash to burn for the fire. Paths that had become over grown and covered with soil and leaf mould were dug off and landscaped and resurfaced with local slate. Drains were cleaned and reinstated. 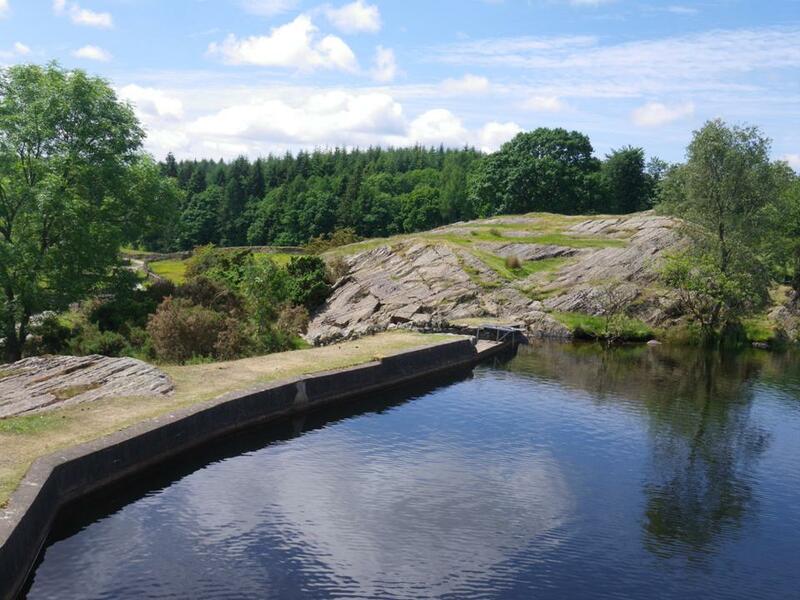 We add a full day on Windermere using Canadian canoes and kayaks as part of the holiday, this gives first timers a chance to try a new sport and for others to view the Lakeland fells from a different perspective. There is nothing better than bobbing about on the water enjoying fantastic views and great company. Once again I have been working with a group of volunteers but this time it was with the National Trust’s regional volunteers. These are people who commit to twelve volunteer work-meets per year. They work with a number of rangers across the region including two sessions per year with me. With that level of experience, they have built up an impressive array of skills which can be used on a wide range of projects. Most of these people return year after year and it is always good to see them and catch up on all our news. This time we were working at Braithwaite trimming back the vegetation along the side of the approach road to Force Crag mine. En route to the start of the job they pointed out that a bridge we were crossing is one that they built in a previous year. It’s always good if volunteers can revisit this type of project and see it in use. An extra benefit to working with this group is that part of their routine is to bring cake – as you can see in the picture, they don’t ‘do things by halves’ and the lunch-time picnic is much enhanced with generous slices! The other theme to the week/weekend was the Keswick Mountain Festival where I ran a ‘Map-reading made easy’ course. This was fully-subscribed and was free – although we don’t refuse donations. It was aimed at people who want to get to grips with basic map and compass work. We started with learning to ‘read’ the contour lines and carried on to recognising other features on the map. We then added taking bearings and back-bearings and also some micro-navigation. We present the material in as many different learning-styles as we can and sooner or later everyone has that moment when the penny drops and they ‘get it’. We have the reward of knowing that a new group of people can go out to enjoy the fells more safely. Over the last couple of weeks we've been getting ready for the upcoming helicopter lifts. Our main footpath repair project this year is on Helm Crag where we'll replace a few sections of old pitching and also repair some areas of path that have started to erode away. We'll be reusing any rock that we can but to complete the job we worked out that we would need an additional 88 bags of stone to be flown to site by helicopter. First we had to carry the empty heli-bags to our rock collection site. Although the bags may not appear like much in the photo below they're certainly not light. So it's a bit of a slog walking up to the collection site with plenty of "calf burn" on the steep sections. With (arguably) the easy bit done it was time to collect up some rock. Each rock is carefully selected and depending what we need it for (pitching, drains or landscaping) we'll gather different types of rock. All the rock is rolled downhill until there's enough rock gathered together to fill up a bag. With the rock all gathered together the next job is to fill the bag. The larger stones are rolled into the bottom of the bag and the smaller ones then rolled on top of them. We try and keep lifting to a minimum as the majority of rock that we use is too heavy to safely lift. Each bag when filled weighs just over 800 kg. Although 88 bags may sound like a lot, in previous years we have filled well in excess of 100 bags and have had much further walks to get to the rock collection sites. So this years bagging was relatively painless...except for one trapped finger! With all the bags filled all we had left to do was put out our warning signs and set up a diversion. We put all the signs out a few days before the lifts to give people prior warning about potential delays and any diversions. If we can reduce the number of people in the area of the pick-up and drop sites it makes things much safer which in turn makes our job much easier. We're now all set for next weeks helicopter lifts. Our lifts are planned to take place Monday 21st May to Wednesday 23rd at Helm Crag, Aira Force and Stickle Ghyll. Regular readers of the blog will know that I have mentioned Castlerigg Stone Circle a few times. Any who have visited will know that it is in a stunning, elevated setting with glorious panoramic views of the surrounding fells. It dates to somewhere around 4.5 thousand years ago and is one of the oldest Neolithic circles in Britain. It became one of the earliest scheduled ancient monuments of Great Britain & Ireland in 1883 and was purchased and donated to the National Trust in 1913 when Canon Rawnsley organised a public subscription. The stones are of a local metamorphic slate with the heaviest being estimated to weigh around 16 tons and the tallest stone measuring approximately 2.3m high. Some stones in the circle have been aligned with the midwinter sunrise and various lunar positions. There is a tradition that attempts to count the stones will produce different answers and there may be some truth in this. It all depends on which stones you count. Some that are now visible are probably stones used merely to pack and stabilise the larger stones. There are many theories for the building of the circle but nobody really knows what Neolithic stone circles were used for. Part of the charm of these sites is that we can each enjoy imagining their use. Your theory might just be right. Current thinking links Castlerigg with the Langdale stone axe industry. The site is situated at the junction between several valleys and the main intersection between the routes from the coast to the Eden Valley and to the Central Fells. If you plotted the axe factory sites in central lakes, the obvious route from the coast would be to head for Castlerigg and follow the Armboth Ridge through to the Langdale fell and central Scafell Massif where the majority of the stone axe factory sites are to be found. Langdale axes have been found in many ritual sites so it’s possible that trade and exchange of the axes would take place with ritual and ceremony at a site like Castlerigg. Langdale was important for axe production because of the greenstone (Borrowdale volcanic series) to be found there. When napped it fractures with a fish-hook-style fracture – a shape that lends itself to the production of good tools and axes. These were of such quality that they were traded across Europe. There is plenty of other evidence for Neolithic activity in the area. Some years ago I helped to document burial mounds on Armboth Fell overlooking the circle. We also have examples of cup & ring rock art in the Borrowdale valley. So there is no doubt that this area was a hive of activity then. All of which makes this a site with some special qualities. You really need to visit to ‘feel’ the place and maybe even imagine your own stories. A couple of weeks ago an induction day was held for potential new Fix the Fells volunteer lengthsmen at the Stickle Barn Tavern in Langdale. Presentations were given explaining all about the project and this was followed up with a walk up Stickle Ghyll to give the potential new volunteers a brief insight into our work. Last weekend we continued training up the new Fix the Fells lengthsmen. Nine volunteers arrived at our office and were given a brief presentation all about the lengthsman role and exactly what is required when you go out on a "drain run". Once they all knew what would be expected of them it was time to head to Loughrigg and put it all into practice. 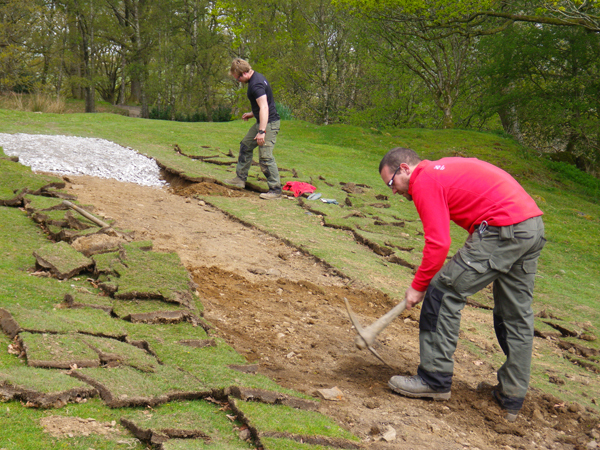 The main job of the lengthsmen is to help us maintain the upland path network. They do this by going out in pairs, or larger groups, on regular "drain runs". The drain run consists of clearing the paths of any rubble, excessive vegetation growth and also monitoring the state of the path. A path monitoring sheet is filled in which states how much of the path has been cleared, if the path appears to be deteriorating at all and whether any repairs may be required. The only tools required for a "drain run" are a shovel and a brush. It is essential that all rubble is removed from the path because it can quickly clog up the drains. This means that during heavy downpours water may overflow down the path, which can result in serious erosion damage. Rubble on stone pitched footpaths is also awkward to walk on, which means people have a tendency of stepping off the path and walking along side it, again causing further damage. When you're out clearing drains you also have to be very aware of people around you. Even a small stone shovelled off the path can start rolling and pick up speed, this has the potential to seriously injure somebody walking on the path below. We timed our walk up Loughrigg so we could stop for a bite to eat at the summit and although there was a cold wind blowing we managed to find some shelter and take in the fantastic views towards Elterwater. ﻿Once we'd had our lunch (and also some excellent homemade flapjack made by one of the volunteers) we headed off down the other side shovelling and sweeping as we went. Protecting 4000+ years of history and also introducing Fletch. I was working this last weekend at Castlerigg stone circle (a Neolithic stone circle just outside Keswick that is 4 to 4.5 thousand years old) with a National Trust volunteer group from the Leeds area of Yorkshire. Members of this group have been coming annually to spend a working weekend in the Lakes for the last 15 years. Over those years they have done huge amounts of work. This year we were re-turfing around the Castlerigg stones. It is a job we do every one or two years depending on the wear and tear caused by the combination of footfall and weather. The heaviest wear of course is immediately around the stones so we replace worn sections with new turf to protect the site and to keep it looking good. We dig out the soil from a section to a depth of about 4 to 5 inches (10 to 12 cm). That is taken across to a strip along the side of the field where we have taken out turf to use for the repair. The soil fills in the strip and is reseeded and the removed turf is laid around the stones in the circle. This is an annual or biannual cycle. We also trial new seed mixes in search of the most sustainable, hard-wearing option for this site. Sunny had his last day with us on the Saturday as he returned to his family on the Sunday. He’ll be able to show off his new swimming and ATV driving skills! The Yorkshire crew carried on without him and, as they always do, completed a fantastic amount of work for the Trust. 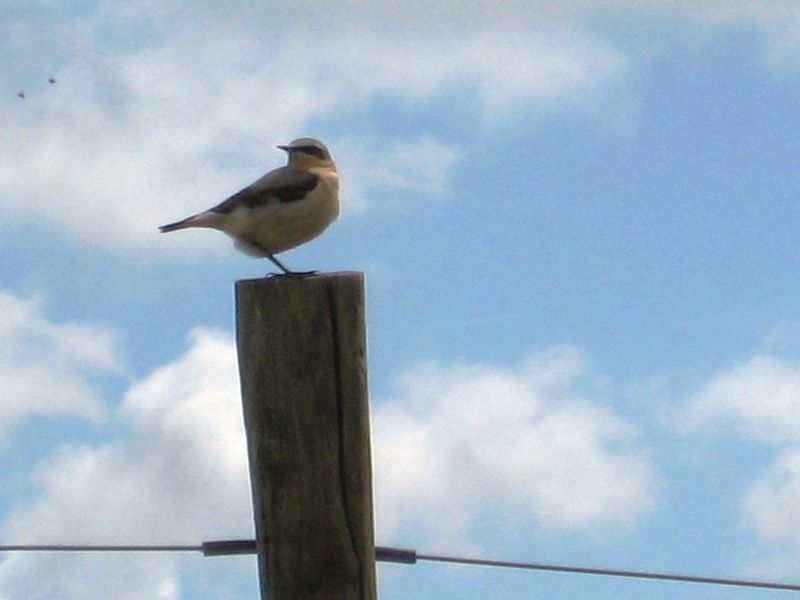 I’ll close this post with a mention of Fletch the perch-crow and his new blog. Fletch is a resident of the gardens at Wordsworth House in Cockermouth who believes that he is the world’s first ever blogging perch-crow. He is going to be blogging about thieving birds, visiting armadillos, crocheted mice called Bubble and Squeak and his life in general. He will also be talking about gardening (particularly heritage gardening) and what’s going on at Wordsworth House plus he’ll be giving useful tips. Go to the following link and you can check out his blog – there’s even a photograph of him! The reed beds and Touch me not balsam stands at Elterwater are being invaded by the American skunk cabbage. A perennial plant with an estimated life span of over 80 years! 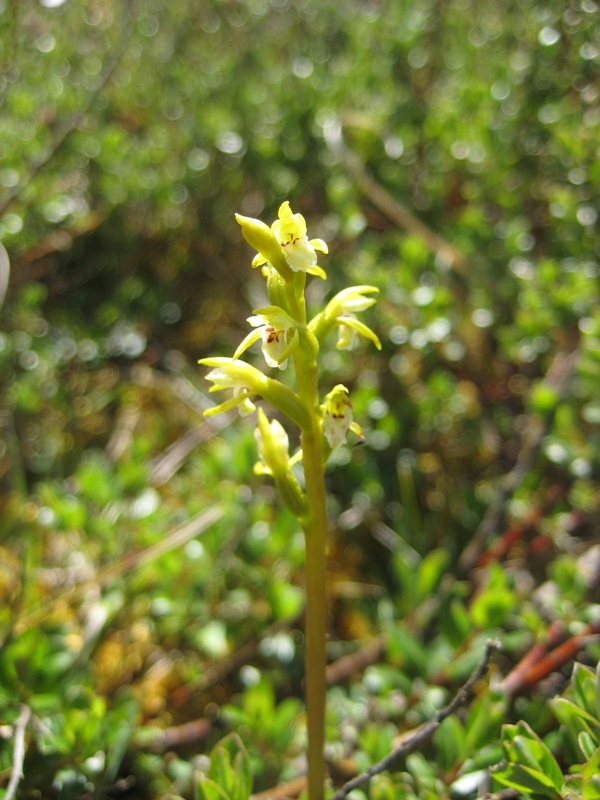 National Trust Rangers are digging up smaller plants, and destroying the seed pods of older specimens. 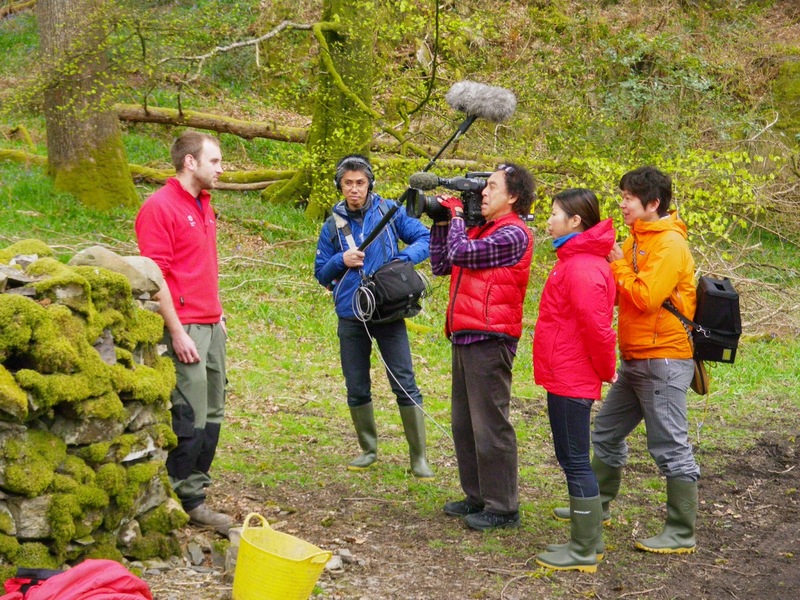 The aim is to limit the spread of skunk cabbage,and prevent it from displacing the native plants at Elterwater. 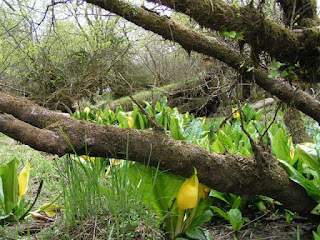 Image of large stand of older skunk cabbage. Note younger plants in right foreground. Image of medium size skunk cabbage just dug up with a lot of effort! Note massive root system. These plants represent a small portion of invasive species threatening our countryside, the National Trust and many other organisations helped with volunteers are making a stand against such species. A lot of resource is also used to try and combat the spread of Himalayan Balsam and Japanese Knot weed. Please keep checking the blog for more posts about this issue.